Rikugien is a Japanese garden located in Bunkyo ward, Tokyo. It's known for its beautiful weeping cherry blossom trees and autumn leaves. In this article, we introduce how to get there and what you shouldn't miss. Rikugien Garden - One of the Most Beautiful Gardens in Tokyo! Rikugien Garden is a Japanese garden located in the Bunkyo ward of Tokyo. While it is beautiful to visit at any time of the year, we especially recommend visiting Rikugien in the autumn, when the leaves of the trees change color. The garden is illuminated in the evening, resulting in a dreamlike sight! The garden was created by Yanagisawa Yoshiyasu, an official of the shogunate during the Edo Period. Highly trusted by the 5th shogun Tokugawa Tsunayoshi, Yoshiyasu was granted the grounds in 1695. Yoshiyasu loved waka, or Japanese poems, and decided to use the land to create a beautiful garden like those described in these poems. Yoshiyasu is said to have designed the garden himself. By 1702, an elegant garden with a man-made hill, a lake, and a river was completed. The shogun Tsunayoshi is said to have taken a great liking to the garden, and to have visited 58 times during his life. Rikugien Garden was established with a landscaping technique called Kaiyu-shiki Tsukiyama Sensui Teien. Gardens of this style consist of a large lake (sensui) and an artificial hill (tsukiyama). The style allows visitors to stroll the garden while enjoying their surroundings. Rikugien Garden is open from 9:00-17:00. The final admission time is at 16:30. The admission fee is 300 yen. Visitors age 65 and above can enter for 150 yen, and elementary school children and younger are admitted free. The garden is closed annually for four days from December 29th to January 1st. The nearest station to Rikugien Garden is Komagome Station of the JR Yamanote Line or the Tokyo Metro Namboku Line. From Tokyo Station, you should get on the JR Yamanote Line toward Ueno and Ikebukuro and alight at Komagome. The ride is 17 minutes and costs 170 yen. It's a 7 minute walk from the station to Rikugien Garden. If you want to relax with some tea while enjoying a lake view, head to Fukiagenochaya. Here you can enjoy a matcha and high-quality confections set for 510 yen (including tax). The facility also offers Rikugien original merchandise. Togetsukyo is a bridge created from two large rocks, connecting to a man-made island in the middle of the lake. After entering from the main gate of the garden, visitors will find the garden's symbolic weeping cherry. Weeping cherry blossoms bloom earlier than regular sakura, and will reach full-bloom around the end of March. During the full-bloom period, the weeping cherry is lit up after dark. 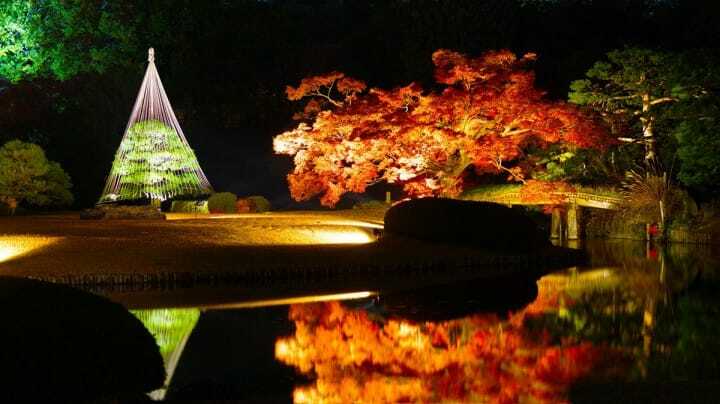 Rikugien Garden is also known as a great spot for viewing autumn leaves. During the best season from late November to early December, the leaves are lit up after dark, and visitors can enjoy a very refined atmosphere. From Rikugien Garden's nearest station, Komagome, you can easily reach Ueno and Nippori. Ueno is five stations away on the JR Yamanote Line toward Ueno and Tokyo. The ride takes 10 minutes and costs 160 yen. Ueno boasts tourist attractions like Ueno Park and Ame-yoko. Nippori is three stations away on the JR Yamanote Line toward Ueno and Tokyo. The ride is 6 minutes long and costs 140 yen. In Nippori you can visit the beautiful area around the Yanaka Cemetary and a textile district. Menu/Pamphlets in Other Languages Garden tours (free) in English available. First and third Sundays at 11:00 and 14:00. *Transportation times and fares are based on information from official websites. Information is as of June 2017. Information is subject to change.